Is public policy advocacy a worthwhile way for CED activists to spend their time? Probably not, if their onslaught is isolated in time, space, or numbers. That's why the Canadian CED Network has dedicated the past two years to honing a policy agenda with input from hundreds of practitioners across the country. 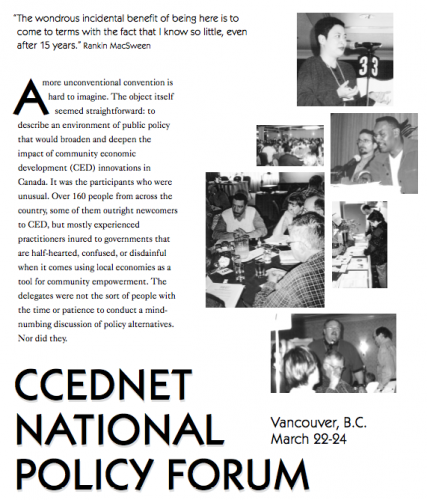 A conference this March in Vancouver, B.C., made dramatic progress on that agenda, and on re-casting CCEDNet as the business end of a national movement. Will the outcomes outdo the inputs? It's too soon to tell. In the words of Rankin MacSween of New Dawn Enterprises, "I do not think it's going to happen tomorrow, but I think we are on the verge of a very important possibility."